India’s campaign started on a poor note as Christopher Zeller’s dying minute goal spoiled their party and Dilip Tirkey’s side went down fighting 2-3 to hosts and defending champion Germany in the opening match of the hockey World Cup here today. Ace marksman Rajyavardhan Rathore ensured India’s dominance at the Asian Clay Shooting Championship when he won the double trap event at the National Shooting Centre here today. Rahul Dravid’s consistent performance over the past one year today earned him four nominations for cricket’s top honours, including the most prestigious Sir Garfield Sobers Award for the ICC Cricketer of the Year. The Indian captain was nominated along with 12 others for the coveted award and he also found himself listed among nominees for Test Player, ODI Player and Captain of the Year awards. Pakistan captain Inzamam-ul-Haq became the most capped one-day player during his side’s two wicket win over England in the third ODI at the Rose Bowl, surpassing veteran Lankan batsman Sanath Jayasuriya’s 364 appearances. Younis Khan’s 101 was the centerpiece of Pakistan’s two-wicket win over England in the third one-day international at the Rose Bowl here. Pakistan, cruising to victory at 215 for four, did suffer a late collapse that saw them lose three wickets for nine runs as they declined to 265 for eight, with fast bowler Stuart Broad striking twice in two balls. The International Cricket Council today did not rule out forensic test of the ball, which was alleged to have been tampered by Pakistan during the Oval Test against England, to ensure a fair hearing for skipper Inzamam-ul Haq. Jelena Jankovic lost so many matches in a row this year that she lost count. But she’d taken enough stats classes at university to figure this: It was may be time to quit tennis and go back to school in Belgrade. Yesterday, Jankovic graduated to her first Grand Slam semifinal. She took away No 4 Elena Dementieva’s serve and coasted 6-2, 6-1 at the US Open. The Punjab Sports department, with a view to boost falling representation of the state in the national and international sports events, revived sports wings with much fanfare a few months back. The state government is yet to accord approval for the purchase of the sports equipment even after the lapse of one month of receiving the tenders. The way the Indians played in the second half, they did not deserve to lose but again luck deserted them at crucial moments. The visitors, who looked patchy in the first session, gave the hosts a good run for their money in the second but could not prevent them from running away with full three points. The Indians, who trailed 0-1 at half time, played their heart out after breather and had the Germans at their mercy in the second session. But all their splendid work went up in the smoke as Germany snatched a last minute victory. For the winners, Christopher Zeller (2) and Oliver Hentschel (1) scored, while Shivinder Singh scored a brace for India. After an uneven showing in the first 35 minutes, India were a transformed side in the next session and they raised the hockey to a high level. Suddenly, flanks flared up and the midfielders looked threatening and it was in the 51st minute that India forced their first penalty corner. Kanwalpreet Singh’s shot hit the onrushing Bjorn Emmerling leading to the second penalty corner and this time, after attempts by Kanwalpreet and Gagan Ajit Singh, Shivinder struck the equaliser, much to the surprise of the German defenders. German counter followed soon and they forced their second penalty corner in the 61st minute and this time Oliver Hentschel sent the ball home to put the hosts in the lead again (2-1). The Indians fought back gamely and shocked the partisan fans with an superb equaliser in the 64th minute when off an Ignace Tirkey move, Shivinder sent the ball home. But their joy was shortlived as just before the final hooter the defending champions struck, taking advantage of the confusion in the Indian defence and Zeller struck, ending India's hope of a World Cup start with a point. Earlier in the first session, Germany dominated the midfield play and made inroads in the Indian striking circle. The half the saw an off-color India and the players could seldom get the ball past the rival defence. The strikers were found wanting and failed to connect as the ball came to the goal mouth. Arjun Halappa missed the best chance two minutes before the breather when he failed to intercept VS Vinay’s cross deep in the right flanks. Halappa had only the rival goalkeeper to beat but he fumbled and Ulrich Bubolz cleared the ball. Earlier, India made two incisive attacks in 15th and 16th minutes. First Shivinder sent a cross to Arjun Halappa but he could not get past the defenders and then Ignace Tirkey set up Gagan Ajit who delayed inside the circle. Gagan Ajit was a pale shadow of his past and was unable to scheme things upfront. 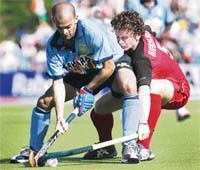 On the left flanks, Tushar Khandekar and Tejbir Singh found the veteran German sweeper Philip Crone quite impregnable. The consistent German onslaughts eventually paid off when a foul tackle inside the circle by Ignace Tirkey led to the game's first penalty corner which was converted with a powerful 119 kmph drag flick by Christopher Zeller (1-0). Buoyed by the goal, the Germans increased the pace keeping the rival defence on tenterhooks and a minute before the half defender Kanwalpreet was sent to the sin bin by umpire Sumesh Putra (Canada) for elbowing Bjoen Emmerling adding further pressure on the overworked Indians. ''We played good game but the Indians displayed tremendous game in the second session,'' said German captain Timo Wess. Rathore, who is on his first visit to Singapore, made it a memorable trip by notching up an impressive score of 190 out of 200. The Indians today took their tally of gold medals to four as, apart from Rathore’s individual feat, they claimed the double trap team gold. Rathore said today’s performance came as a surprise for him. "I was really not expecting such a high score, as I was still preparing and it has been a long and busy year with so many competitions,” said Rathore, the Athens Olympics silver medallist who also won the Commonwealth Games gold earlier this year. The Indian trio of Rathore (142), Ronjan Sodhi (138) and Vikram Bhatnagar (136) grabbed the team gold with 416 points. Shih Wei Tin, an Asian Games silver medallist behind Rathore, led Chinese Taipei to silver with 409 points. The United Arab Emirates, led by individual silver medallist here Saif Al Shamsy, took his team to bronze with 406 points. “The competition was pretty decent with shooters from Qatar and UAE, who are strong in this event,” added Rathore. Rahul Dravid’s consistent performance over the past one year today earned him four nominations for cricket’s top honours, including the most prestigious Sir Garfield Sobers Award for the ICC Cricketer of the Year. The Indian captain was nominated along with 12 others for the coveted award and he also found himself listed among nominees for Test Player, ODI Player and Captain of the Year awards. Dravid had bagged this award in its inaugural edition in 2004. The only other cricketers who figure in four categories are Australian captain Ricky Ponting and Sri Lankan skipper Mahela Jayawardene as per the list released by ICC Chief Executive Malcolm Speed here today. Irfan Pathan and Yuvraj Singh, the only two Indians apart from Dravid in the nominations, will be vying for the ODI Player of the Year award. Captain of the Year is a new award constituted this year along with another, the Women’s Cricketer of the Year. Anjum Chopra and Neetu David are the two Indian nominations for the Women’s Cricketer of the Year award. The Hyundai ICC awards, which take into account performance in the period between August, 2005, and August, 2006, will be presented at the National Centre for the Performing Arts in Mumbai on October 23. Inzamam will increase his lead over his nearest rivals with two more ODIs at hand against England in the ongoing five-match NatWest series. But, his milestone of 365 ODI caps could be shortlived as Sachin Tendulkar is at a close third with 363 matches so far and has chances of playing five matches in the Malaysian tri-series from September 12 to 24 with Australia and the West Indies as the other two teams. Younis Khan’s 101 was the centerpiece of Pakistan’s two-wicket win over England in the third one-day international at the Rose Bowl here. Pakistan, cruising to victory at 215 for four, did suffer a late collapse that saw them lose three wickets for nine runs as they declined to 265 for eight, with fast bowler Stuart Broad striking twice in two balls. Victory yesterday saw Pakistan go 2-0 up and meant they could not lose the five-match series heading into Friday’s fourth fixture at Trent Bridge. This defeat was England’s ninth in nine completed limited overs fixtures this season and meant they had won just four of their last 24 fixtures in shorter forms of cricket. Set 272 to win, Pakistan finished on 274 for eight after a third-wicket stand of 167 in 31 overs between Younis and Mohammad Yousuf (60) saw the duo defy the conventional wisdom by successfully batting second under the lights after skipper Inzamam-ul-Haq had won the toss. Inzamam was 44 not out and Shoaib Akhtar two not out as the tourists won with seven balls to spare when the captain pulled Rikki Clarke for four. Fall of wickets: 1-0, 2-79, 3-113, 4-125, 5-226, 6-229, 7-250, 8-256, 9-268. Bowling: Akhtar 10-1-59-2, Asif 9-0-51-0, Razzaq 8-0-44-2, Naved 10-1-57-4, Afridi 6-0-26-0, Hafeez 3-0-14-0, Malik 4-0-19-0. Fall of wickets: 1-2, 2-29, 3-196, 4-215, 5-217, 6-256, 7-256, 8-265. Pakistan were spared of another controversy yesterday after ICC Match Referee Mike Procter for their third one-dayer against England cleared fast bowler Shoaib Akhtar of any suspicion of ball tampering. Sky TV repeatedly showed slow motion pictures of Akhtar “scuffing the ball with his nails” in the 25th over, three balls after he had dismissed Ian Bell. With Tuesday’s win, Pakistan have taken an unassailable 2-0 lead in the 5-match series. The pictures showed a close-up of the Pakistani fast bowler walking back to his bowling mark and lightly pressing the tip of his left thumb against the ball. Umpires Billy Doctrove and Nigel Llong checked the ball later in the England innings but did not change it. ICC match referee Mike Procter made a statement at midnight that no action would be taken against the fast bowler after studying footage provided by Sky TV of the incident. ICC Chief Executive Malcolm Speed said forensic test had been suggested and it could be part of the evidence that would be examined when the hearing takes place later this month. “Forensic test is being suggested. The laws of cricket are clear on what constitutes changing the condition of the ball. Lawyers of Pakistan and the ICC are studying what evidence can be put forth,” Speed said on the sidelines of a press conference to announce the nominations for this year’s Hyundai ICC Awards. In the absence of video or photographic evidence of whether Pakistani players altered the condition of the ball, which is in possession of the ICC, forensic test is expected to provide the vital clue. However, it is not clear whether a forensic test can actually establish conclusive evidence if a ball had been tampered with intentionally. Speed, nevertheless, stressed that ICC was all for a fair hearing. “We want a fair hearing. We don’t want to sit on the side of the umpires, we don’t want to sit on the side of the team. We want to sit in between them and accept whatever decision is made by the adjudicator,” he said. Speed said no date had been decided as yet for the hearing but it would be anytime in the last week of September. “No final date has been agreed upon. But it will be announced in a day or two,” he said. However, Speed denied suggestions that the ICC had deliberately delayed the hearing to allow matters to settle down. “We were very keen and would have preferred to have the hearing in the match referee’s room right after the match as it happens in normal circumstances. 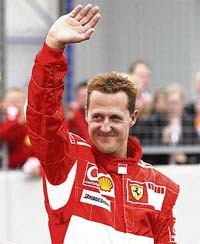 But Ranjan Madugalle had a serious personal problem, which needed his urgent attention. In no way we were seeking to defer the hearing,” Speed said. 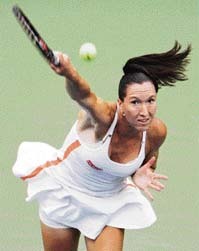 Jelena Jankovic lost so many matches in a row this year that she lost count. But she’d taken enough stats classes at university to figure this: It was may be time to quit tennis and go back to school in Belgrade. Yesterday, Jankovic graduated to her first Grand Slam semifinal. She took away No 4 Elena Dementieva’s serve and coasted 6-2, 6-1 at the US Open. The 19th-seeded Serbian became the first player to reach this year’s semifinals at Flushing Meadows, and will face the winner of the match between Lindsay Davenport and Justine Henin-Hardenne. The 21-year-old Jankovic posted the biggest victory of her career, winning every game when Dementieva served. Earlier this year, Jankovic wasn’t winning anything. She lost nine straight matches after the Australian Open and wondered what was next. Andy Murray's hopes of a first grand slam quarter-final ended in disappointment today when he was beaten 6-1, 5-7, 6-3, 6-0 by seventh seed Nikolay Davydenko of Russia. Resuming at two sets to one after the fourth-round match was held over from yesterday because of rain, Murray made 13 unforced errors in the fourth set and Davydenko cruised to victory. However, even after several months not even a single piece of equipment has been issued to budding players. How can results be expected from the players who have not been given any equipment to hone their skills with. Another glaring deficiency is inadequate number of coaches. The department has only three coaches for seven sports wings and six day scholar centres running in various schools of this district. The department utilises the services of three sports persons on deputation from the Punjab Police to impart coaching. Besides, it has two Sports Authority of India (SAI) coaches. These two coaches are for badminton and football. As the city does not have any football ground, the coach holds coaching session at the Khalsa Collegiate Senior Secondary School ground. Amazingly, the district has a wing and a day scholar’s centre of boxing but no coach. They feel that their efforts would not be able to bear maximum results as they were not being trained on technical lines. Without the right guidance it was not easy to deliver results, they stated. A player of sports wing receives Rs 60 a day as diet money and resides in the hostel provided by the school or institution whereas a player of day scholar centre gets Rs 30 a day. As per the guidelines of the Sports Department mandatory five hours of coaching is to be imparted to budding players which is normally given in morning and evening. Already facing paucity of staff, the department has now been asked to spare persons for election duty. The local sports office is finding it difficult to hold block level rural games and district tournaments as per schedule. According to directions of the Sports Department, Chandigarh, block level tournament for boys and girls under-16 should be organised between September 4 to 15 and district tournament from September 17 to 19. For the past many years the sports department had not made any purchases for want of funds. However, this year the government sanctioned Rs 50 lakh and along with an amount of about Rs 2 crore from Punjab Sports Council, the department would make purchases after a gap for about five years. But for the reasons best known to the authorities, the final approval for the purchase has not been granted. Interestingly, the samples of the sports equipment are already lying in Ludhiana, where the central warehouse of the department is located. Even the samples are awaiting disposal. And nobody appears to be certain as to when the final approval for the purchase of the equipment would come from the government. This probably explains the progressive decline in sports achievements of the state. At one stage the representation of the state in the national squads would go up to 25 percent. But that seems to be a thing of the past, thanks to the callous indifference of the authorities towards sports. The delay in purchasing the equipment is causing the sportspersons very dear. They use sports apparatus, most of which is outdated. This not only affects their training but can also cause them injury. Further delay in purchasing the latest equipment could disturb sportspersons’ preparations for the upcoming sports meets. When contacted, Mr Pargat Singh, Director, Sports, Punjab, exuded confidence that they would soon receive the government approval to purchase the equipment required for the coaching and training of the players to prepare them for the competitions. The whole process of purchasing the equipment would be completed in a few days, Mr Singh said.